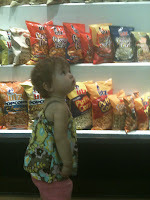 A few weeks ago Aunt Reesa suggested a visit to the Utz Potato Chip Factory in Hanover, Pennsylvania and we more then happy to accompany her because who doesn't love Utz potato chips. The drive to Hanover was a little more then an hour and filled with beautiful scenery, cows, sheep, horses and lakes to keep toddlers entertained. The tour is self guided with push buttons that give you information about what you are seeing through the large windows that overlook the factory floor. You get to see the entire chip making process starting with the potatoes being washed and peeled, fried, seasoned, bagged, boxed and finally stored. It was fascinating, everyone 1 year olds through 30 year olds loved it. Watching how all the machine worked and seeing all the chips was amazing. We loved watching and they had little ramps for kids to stand on so th ey could easily see through the windows on their own, a very nice touch! By the time we had finished the tour we were hungry and so we went back to the entry room and each got a bag of chips to sample, in addition to a bag or "Cars" pretzels. In this room they also had a case with all the different fla vors they make that we loved looking at and discussing the ones we had tried and the ones we wanted to try. After the tour we drove a few blocks away to the factory outlet store where they sell everything Utz. The largest variety of chips and pretzels I have ever seen. They even had all the components of the party mix sold separately so you could get a tub of the thing you usually dig through the bag to find. We also got cinnamon pretzels, Utz temporary tattoos and chocolate covered potato chips which we are planning to use to make ice cream! I SO want some of that Chocolate Pretzal ice cream!!! In the freezer with your name on it!